Nigeria’s two main oil workers’ unions have begun a nationwide strike, threatening to hurt the output of Africa’s largest oil producer. They are now protesting that the government has allowed Nigeria’s oil refineries to fall into disrepair and that the poor state of the country’s roads is hindering the transport of oil. “We’ve commenced the strike. It will affect oil production, since all operations are on strike,” Pengassan chief Babatunde Oke told Reuters. “It’s very difficult to shut them down, and once they do, it would take them a week to get them back up. They never do it. That’s the last thing anyone wants,” an oil executive told Reuters. The BBC’s Will Ross in Lagos said most of the unions’ demands seemed “unrealistic, especially with an election looming”. 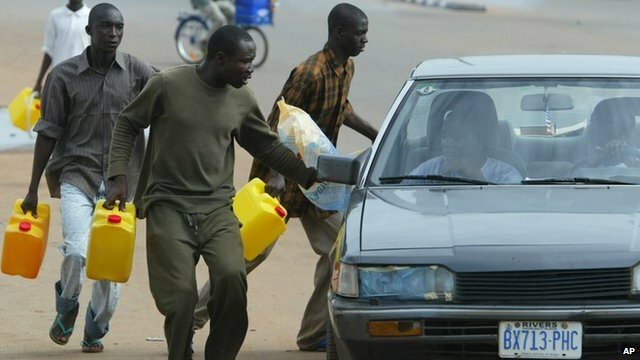 “The refineries are not suddenly going to be fixed because of this strike. Some oil industry watchers suggest the unions are simply trying to force the government to pay them off and get a hefty Christmas present,” he added.